Most of us learned about Justice Thurgood Marshall in school. We all know he was the first black Supreme Court Justice, nominated by Lyndon Johnson in 1967. But few know of the heroic life he lived leading up to that high profile position. 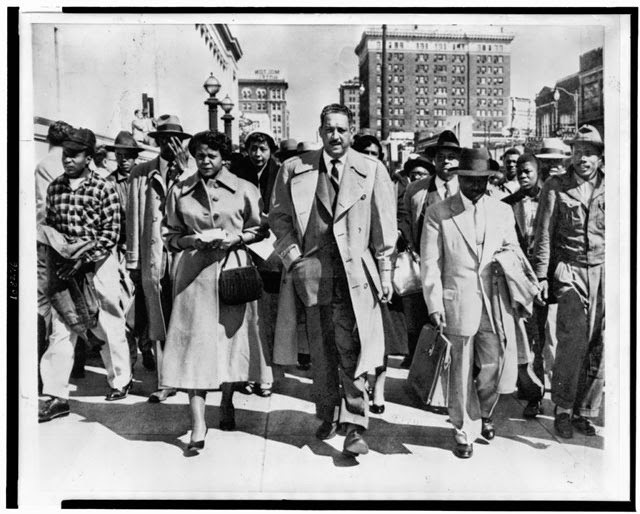 Filmmaker Mick Caouette has set out to change that with his new documentary Mr. Civil Rights: Thurgood Marshall and the NAACP, scheduled for a fall 2014 release. Mick said he wanted to make the film because he hoped to shine a light on the Thurgood Marshall none if us knew. He states, "He was the first black Supreme Court Justice, which is probably the most significant thing… A lot of people only know him from that period… But the early part of his life was, in many ways, more courageous — from 1908, when he was born, to the early 1950s… So the story we're telling is that story of that period." He continues, "He traveled the south as an NAACP lawyer and fought case after case in these white courtrooms. It was really dangerous. He was at the foot of death wherever he went. And he traveled a lot alone. Always running from the Ku Klux Klan and other people. He slept in three or four different houses some nights and just kept moving, and all by train from Harlem to the South. He was a really courageous person." Marshall was trying to do what no one else at the time would dare. Mick explains, "He was trying to bring equalization to education. He was trying to enroll African Americans in colleges and high schools. So the Brown vs. Board of Education decision was the culmination of his journey in 1954 and 1956." The filmmaker, who has been making docs since the '90s, didn't know much about Marshall himself when he decided to make the film. He recalls, "I knew something about him from [my earlier film, "Hubert H. Humphrey: The Art of the Possible"] because they knew each other. Humphrey was Vice President when Marshall became Supreme Court Justice. For the Humphrey film we interviewed Roger Wilkins who was Roy Wilkins nephew. Roy Wilkins and Thurgood Marshall were best friends and they ran the NAACP together." When Mick contacted Wilkins to do a film about his uncle, Roger suggested he look into Marshall instead. "So I dug into it a little bit and he is a colorful person." The film tells the story of how Marshall paved the way for the 1960s Civil Rights Movement. Mick tells us, "He had a dozen Supreme Court cases that had been decided that he had won, that were the foundation for all the things that happened in the '50s and '60s, like Rosa Parks. Those decisions were based on his victories in the Supreme Court." During his research, Mick was most surprised to learn about Marshall's courage. He claimed, "I had no idea that he did what he did. At one point they brought him to the river to lynch him and he was arguing in the Supreme Court within weeks. So absurd. He got away from them at the last minute, because another group of black guys that came back from World War II had guns in the car and they chased the crowd and got him freed. That's the kind of courage he had. He was going to these kinds of places where they wanted him dead… It's not a well known story and that's why I wanted to do it." Marshall went about his crusade under the radar and was never really acknowledged for his contribution to the Civil Rights Movement. Mick points out, "He was a real hero… He was not out in the public. He was behind the scenes doing all this. He laid the foundation for the [Civil Rights Movement] and never really got credit for it." In fact Marshall was so behind the scenes that it posed a problem for Mick while making the film. "It was tricky because he didn't really travel with a camera person, so it was hard to find visuals." But he found resources to help round out the doc. "There were a few black filmmakers from the '40s and '50s that were shooting around Harlem and they were shooting these amateur films. And I found a number of those that were public domain and used scenes from them. And also there a lot of photographs of Marshall. And then I used contextual film from the time of Harlem and New York and other places… But I panicked at first at what I got into. There's nothing. There was no TV, no anything at the time… If you look through the old newsreels, everything's covered except African Americans, through the whole period. They were nonexistent. So it was tricky but it worked." Mick hopes the film will be an inspiration to all people facing any kind of hurdle. He says that the film is evidence that "incredible obstacles can be overcome with persistence and drive and the belief that you can change things. What [Marhsall] changed and what he did is no less difficult than any problem we face now. He was overcoming everything. He was overcoming race. He was overcoming opposition everywhere he turned, and yet he did it. It's a story of inspiration and courage." To find out more about Mick Caouette's film Mr. Civil Rights: Thurgood Marshall and the NAACP visit Mick's website at southhillfilms.com and watch for the doc on screens this fall.